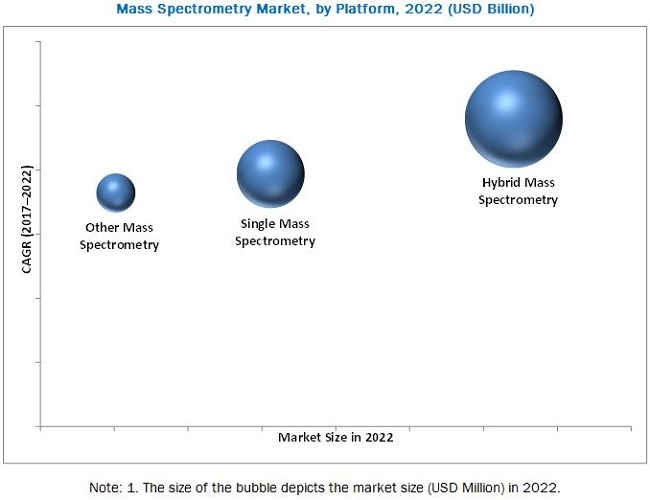 [176 Pages Report] The overall mass spectrometry market is expected to grow from USD 3.44 billion in 2016 to USD 5.27 billion by 2022, at a CAGR of 7.4% from 2015 to 2020. Mass spectrometry is an analytical technique used to measure known materials, to identify unknown compounds within a sample, and to evaluate the structure and chemical properties of different molecules. The technique ionizes chemical species and sorts the ions, based on their mass-to-charge ratio. Because of the high sensitivity of these techniques, mass spectroscopy has become a powerful analytical tool for testing in various industries. Factors such as technological advancements in mass spectrometry, government initiatives for pollution control and environmental testing, increasing spending on pharmaceutical R&D across the globe, growing petrochemical industry, and growing focus on ensuring the quality of food products are expected to drive the growth of this market. The base year considered for the study is 2016, and the forecast has been provided for the period between 2017 and 2022. Several pharmacopeias have laid down quality specifications for active pharmaceutical ingredients (APIs) and finished pharmaceutical products (FPPs), which confine the amounts of metal residues and endotoxins in pharmaceutical products to certain limits. These constrictions have prompted pharmaceutical companies to procure and utilize mass spectrometers in their quality control (QC) departments. Mass spectrometers are used to characterize the structural composition and identify impurities within therapeutic compounds during drug development. Considering the growing pharmaceutical research and development activities owing to the emergence of biosimilars, phytopharmaceuticals, and regenerative medicine, there is a growing need for pharmaceutical products to be characterized for metabolites and impurities. This is creating a demand for advanced analytical equipment, such as mass spectrometers, in this industry. To track and analyze recent competitive developments of market players such as product launches, expansions, acquisitions, and partnerships. During this research study, the key players in the market were identified through secondary research and their market shares were determined through primary and secondary research. This entire procedure includes the study of the annual and financial reports of the top market players and extensive interviews for key insights from industry leaders such as CEOs, VPs, directors, and marketing executives. All percentage shares, splits, and breakdowns were determined by using secondary sources and verified through primary sources. All possible parameters that affect the markets covered in this research study have been accounted for, viewed in extensive detail, verified through primary research, and analyzed to get the final quantitative and qualitative data. This data is consolidated and added with detailed inputs and analysis from MarketsandMarkets and presented in this report. 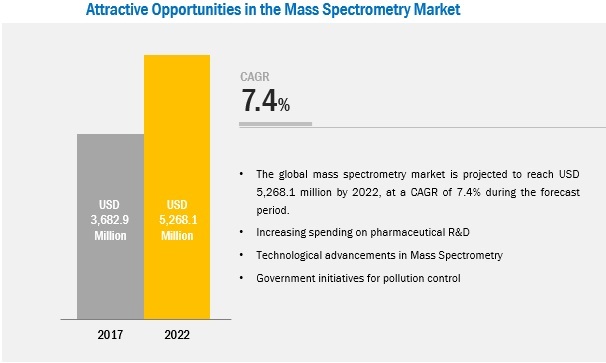 The mass spectrometry market comprises a network of players involved in the research and product development; instrument manufacturing; distribution and sale; and post-sales services. 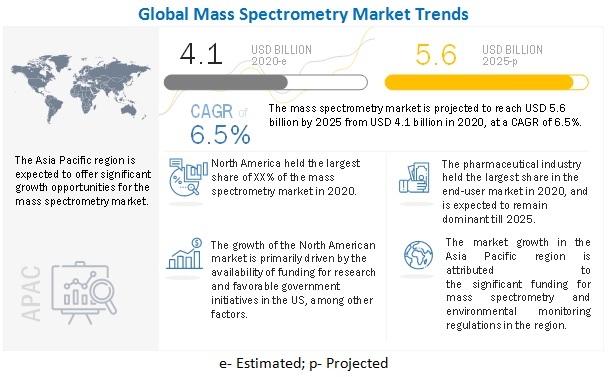 Key players considered in the analysis of the mass spectrometry market are Agilent Technologies (US), Thermo Fisher Scientific (US), Waters Corporation (US), SCIEX (a subsidiary of Danaher) (US), Bruker (US), PerkinElmer (US), JEOL (Japan), Analytik Jena (Germany), Hiden Analytical (UK), Rigaku (Japan), LECO (US), and DANI Instruments (Italy). In 2017, Thermo Fisher Scientific launched the Cascadion SM Clinical Analyzer, the ISQ EC Single Quadrupole Mass Spectrometer, and Q Exactive HF-X Mass Spectrometer, to enhance its Liquid Chromatography Mass Spectrometry segment. In 2017, Phytronix Technologies has agreed to make available its triple ion source, the Phytronix LDTD (Laser Diode Thermal Desorption Ion Source) to be coupled with Shimadzu’s LCMS- 8060 triple quadrupole mass spectrometer for rapid sample analysis. In 2015, PerkinElmer collaborated with Albany Molecular Research (US), offering its screening capabilities, cellular imaging, and analytical instruments to AMRI for its drug discovery and translational research. What are new application areas which the mass spectrometry companies are exploring? The overall mass spectrometry market is expected to grow from USD 3.68 billion in 2017 to USD 5.27 billion by 2020 at a CAGR of 7.4%. The technological advancements in mass spectrometry, government initiatives for pollution control and environmental testing, growing drug safety concerns, increasing spending on pharmaceutical R&D across the globe, growing petrochemical industry, and growing focus on ensuring the quality of food products are the key factors driving the growth of this market. Mass spectrometry is an analytical technique used to measure known materials, to identify unknown compounds within a sample, and to evaluate the structure and chemical properties of different molecules. The technique ionizes chemical species and sorts the ions, based on their mass-to-charge ratio. Because of the high sensitivity of these techniques, mass spectroscopy has become a powerful analytical tool for testing in various industries. The mass spectrometry market in North America is expected to grow at the highest CAGR during the forecast period. North America is the fastest-growing market for mass spectrometry. The key factors influencing the growth of this market include the growing funding for environmental testing in the US, widespread usage of mass spectrometry in the pharmaceutical sector, growing food safety concerns in the US, and government initiatives to improve lab infrastructure and propel fundamental scientific research in Canada. Mass spectrometry has major applications in the pharmaceutical industry, right from the early stages of drug discovery to the late-stage development and clinical trials. Also, mass spectrometry is routinely employed by pharmaceutical companies as a part of Good Manufacturing Practices (GMPs). Several pharmacopeias have laid down quality specifications for active pharmaceutical ingredients (APIs) and finished pharmaceutical products (FPPs), which confine the amounts of metal residues and endotoxins in pharmaceutical products to certain limits. These constrictions have prompted pharmaceutical companies to procure and utilize mass spectrometers in their quality control (QC) departments. Mass spectrometers are used to characterize the structural composition and identify impurities within therapeutic compounds during drug development. Further, as imports of pharmaceuticals from China and India have increased in the US, there is a growing focus on QC processes in the manufacturing units in these countries as they are required to follow the regulations/guidelines set by the US Pharmacopeia (USP), which regulates even trace amounts of elements in final products. In biopharmaceutical research, advancements in mass spectrometers [such as the development of matrix-assisted laser desorption/ionization mass spectrometry (MALDI-MS) and electrospray ionization mass spectrometry (ESI-MS)] have made them applicable for determining protein molecular mass, peptide mapping and sequencing, active site characterization of enzymes and other structural characterizations, and determining disulfide bonds. Besides this, the identification of drug metabolites, synthesis products, and protein fragments is a central activity in many types of research projects. In Genomics, mass spectrometry can be utilized for the characterization of single nucleotide polymorphisms (SNPs) and short tandem repeats (STRs), mainly through MALDI- and ESI-based analysis. Mass spectrometry, owing to its specificity and high efficiency, has significant applications in the oil and gas industry. This technique helps in the monitoring and testing of petroleum refining processes and finished products in the oil and gas industry. High-resolution mass spectrometry techniques, such as Fourier-transform ion cyclotron resonance (FT-ICR), inductively coupled plasma mass spectrometry (ICP-MS), and quadrupole time-of-flight (Q-TOF), enable ultra-trace detection levels to ppm (parts per million), ppb (parts per billion), and ppt (parts per trillion) for purity, contamination, and multi-elemental analysis. The growth in the number of new oil and gas fields is one of the major factors driving the growth of this application segment. Mass spectrometry has wide applications in pesticide screening, soil contamination assessment, qualitative and quantitative identification of elements in environmental samples, and testing of drinking water. Mass spectrometry can also be used in pollution monitoring and trace elemental analysis of heavy metal leaching. The growing environmental pollution levels as well as the rising environmental awareness are the major factors driving the growth of this application segment. Environmental testing laboratories use gas chromatography-single quadrupole mass spectrometry to qualify pesticides such as dichlorodiphenyltrichloroethane (DDT) in groundwater, soil, and air. Tandem mass spectrometers are used in pesticide screening for identifying compounds like nitrophenols, which contaminate drinking water sources; whereas, ICP-MS is used to detect metals in environmental samples to the parts per quadrillion (ppq) levels. Similarly, LC-MS orbitrap analyzers are used in wastewater analysis for nitrosamine detection, while LC-Tandem mass spectrometers are used to detect perfluorinated organic compounds (PFOS) even at low concentrations. Mass spectrometry is one of the commonly used techniques for food and beverage analysis. The focus on effective quality assurance processes is increasing in the food and beverage industry owing to the increasing health concerns of consumers and the growing demand for high-quality, safe, and nutritious products. Various contaminants, such as pesticides, antibiotics, and toxins from different sources, can be found in food and beverages in very low concentrations. Mass spectrometry is an effective technique used for the detection of these contaminants in food and beverage products. This technique is also used in the quality control and testing of additives, toxins, and residues, and the characterization of the nutritional composition of foods (by elucidating the amount of biomolecules, such as vitamins, proteins, carbohydrates, and lipids in food products). This segment covers the application of mass spectrometry in areas such as clinical usage, academic research, and the perfume industry. In the perfume industry, GC-MS is an indispensable technology used to determine the composition of perfumes and in the quality control and trace analysis of substrates. Mass spectrometry can be used to identify all types of organic and inorganic compounds, ranging from human specimens to very low-level concentrations of compounds, with great accuracy. This has led to its increased use in diagnostic laboratories. LC/MS/MS has been widely accepted in various clinical research laboratories as the technique of choice for the accurate and specific quantitation of molecules. Also, the need for greater precision in immunoassays has resulted in an increase in the use of liquid chromatography-tandem mass spectrometry for translational clinical applications. What are the upcoming industry applications for mass spectrometry? The high cost of mass spectrometry segments is a major factor restraining the growth of the market. Spectrometry instruments are equipped with advanced features and functionalities and thus are priced at a premium. Owing to technological advancements and increased operational efficiencies, the demand for mass spectrometers has grown over the years. However, technological developments have resulted in an increase in the prices of these systems. For instance, the cost of a new spectrometry instrument may vary from USD 75,000 to USD 500,000. The price for a single mass spectrometry system ranges from USD 400,000 to USD 350,000 while a GC-MS may cost around USD 50,000 to USD 100,000, depending on the associated accessories. The price of a spectrometer influences the purchase decision of end users. Pharmaceutical companies require large numbers of such systems and hence, the capital cost increases significantly. Furthermore, academic research laboratories find it difficult to afford such systems as they have controlled budgets. Key players in the market Agilent Technologies (US), Thermo Fisher Scientific (US), Waters Corporation (US), SCIEX (a subsidiary of Danaher) (US), Bruker (US), PerkinElmer (US), JEOL (Japan), Analytik Jena (Germany), Hiden Analytical (UK), Rigaku (Japan), LECO (US), and DANI Instruments (Italy). These players are increasingly undertaking product launches, partnerships, collaborations, and acquisitions to sustain their market shares in the mass spectrometry market.